The Justice Department on Tuesday announced a “landmark” agreement with the State of Rhode Island to free people with developmental disabilities from a decades-old system that kept them unjustly segregated in sheltered workshops and adult day programs, removed from the competitive workplace and the broader community. The settlement, which addresses the civil rights of about 3,250 Rhode Island residents, also provides a road map to compliance for the 49 other states, federal officials said. They estimated that across the country, 450,000 people with intellectual and developmental disabilities while away their days in essentially cloistered environments. The court-approved agreement, known as a consent decree, was announced in Providence at a news conference attended by officials from the Justice Department and Rhode Island, including Gov. Lincoln Chafee, as well as by people with developmental disabilities and aspirations who spent years stuck in sheltered workshops that financially exploited them. There was, for example, Steven Porcelli, 50, of North Providence. In a telephone interview before Tuesday’s announcement, he recalled graduating from high school, working briefly at a hardware store, and then being sent to a sheltered workshop run by a nonprofit company called Training Thru Placement. 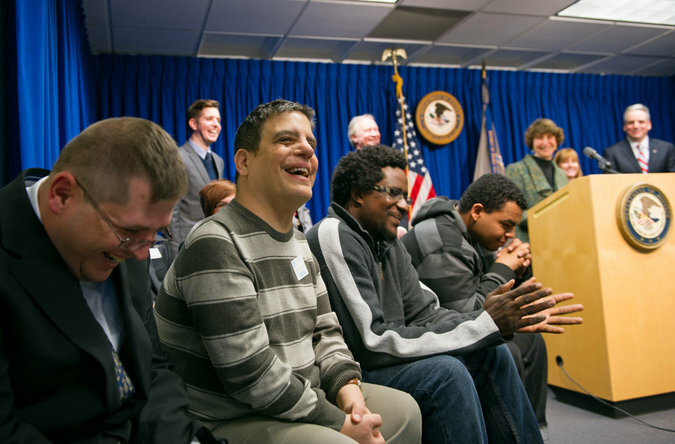 Jocelyn Samuels, the acting assistant attorney general for the Justice Department’s Civil Rights Division, cited Mr. Porcelli’s case, among others, in unveiling what she called the “landmark settlement” to address the “unnecessary segregation” of sheltered workshops and day facilities. ■ Redirect the “significant” public funds that are used to support segregated settings toward encouraging services in integrated settings. In other words: inclusion, rather than exclusion, as upheld by the 1999 Supreme Court case known as Olmstead v. L.C., in which the court determined that the unjustified segregation of people with disabilities constituted discrimination. The seeds for the agreement were planted more than a year ago, when federal Labor Department officials determined that Training Thru Placement, in North Providence, had abused a federal law that allows the payment of subminimum wages to people with disabilities. The employees were being paid, on average, about $1.57 an hour, with one earning as little as 14 cents an hour. An investigation by the Justice Department found that most of the people receiving state- and city-funded employment and daytime services, through segregated programs like Training Thru Placement, yearned for more integrated surroundings. Some had been requesting to join the competitive work force for years, but had been ignored. Investigators also determined that a vocational program at Mount Pleasant High School in Providence — where some students were “doing tasks like sorting buttons,” Ms. Samuels said, “instead of being taught or prepared for work life after graduation” — had become a kind of feeder system into the Training Thru Placement operation. Officials said that the program was shuttling young people with disabilities into a segregated work world, and using state and federal funds to do so. Last June, the State of Rhode Island and the City of Providence entered into an interim settlement agreement with the Justice Department to resolve these violations. But federal investigators continued, broadening their scope of inquiry to include the entire state. They determined that Rhode Island had “overrelied” on segregated settings, to the exclusion of integrated alternatives. About 80 percent of the people with developmental disabilities who were receiving state services — about 2,700 people — were placed in segregated sheltered workshops and facility-based programs. In addition, only about 5 percent of the young people with developmental disabilities leaving secondary schools from 2010 to 2012 went on to jobs in integrated settings — even though many were capable of working in the competitive workplace. Federal and state officials said they had received a positive response from businesses to the reforms. They said that the U.S. Business Leadership Network, a network of Fortune 500 companies, and Walgreens would sponsor a business summit meeting in Rhode Island in June to explore ways to expand the training and employment of people with development disabilities. Ms. Samuels explained that those employed in sheltered workshops would be exposed to other opportunities, but would be allowed to remain in the workshops if that is their preference. “We are not shutting them down,” she said.